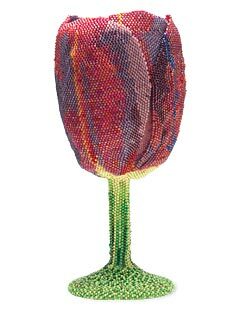 My main work is beaded pictures and a few sculptural objects. I am fascinated by the nuances of color and light in a landscape or a face. Seed beads are my main interest. I based this on a favorite snapshot from a Greek vacation. For this picture, I used Joanne Strehle Bast's method of making a torn-paper collage based on the photo. This helped to simplify the elements. I started with the most dominant lines of the pillars and worked my way out from there. I used several bowls of "bead soup" in different color ranges and selected each bead for its size, shape, and color as I went. I received some finely crafted fringed seed bead earrings as a gift in the late 1980's and, clever as I am, I could not figure out how they were made. I experimented, but my attempts were not pretty. Then I found a book with a variety of bead projects, and my earrings had a name (brick stitch) and instructions. As I began making some of those earrings, it became pretty clear that uneven beads made wiggly fringe (and not in a good way). But I loved working with seed beads and tried more things. My love for beading pictures was spurred on by a class I took from Joanne Strehle Bast on making pictures with freeform brick stitch. I was thrilled to get off the strict grid of weaving and peyote so that I could get great lines in my work where I wanted them. 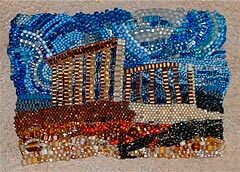 Eventually I figured out that I could do similar things with bead embroidery, and now do most of my pictorial work that way. I come from a family of artists. My grandmother, Mary Brubaker painted in watercolor and oil. My bother, Jack Brubaker, is a printmaker and artist-blacksmith. My sister, M'lou Brubaker is a jeweler. I think I first saw an ad for Fire Mountain in one of the beading magazines, and I have been a customer ever since. I belonged to the Bead Society of Greater Chicago for about 10 years, and they were incredibly supportive in helping me both find my way in beads, and also in getting my work out in the world. My beading is a part-time passion, and a great way to spend my evenings. It is calming to focus intently on getting each carefully selected bead in place. And it's great fun to see a drawing or photo turn into a beaded surface. I have sold my work through art fairs, open houses, websites, and galleries. I have entered contests (Bead Dreams, Bead International, Fire Mountain). 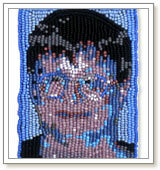 I have participated in Bead Challenges through the bead society and online. I have submitted my work and had it published in Bead and Button, Beadwork, 500 Beaded Objects, and show catalogs. I participated in a bead quilt project to raise money for breast cancer causes. I have donated items to church fundraisers. One fall I taught an afterschool program for local girls; we made tons of jewelry together. Get your work out into the world. Don't be afraid to submit your work to contests or juried shows.